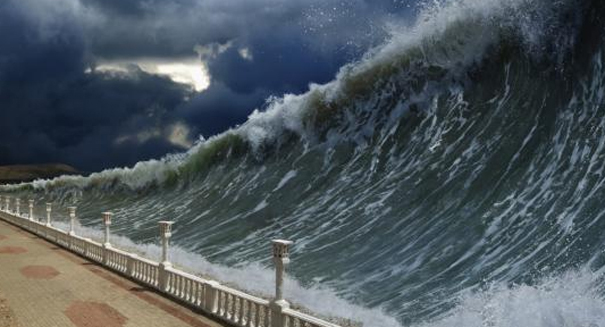 Is a tsunami about to slam into Southern California? Scientists looked deep into the Pacific Ocean to find out how the Earth's crust was behaving ... and they made a rather alarming find. An alarming new study has found that people who live in Southern California are more at risk of a deadly tsunami than they realize. Geological fractures were discovered offshore that could result in an earthquake that would measure 8.0 on the Richter scale, and would cause the crust to move violently upwards, sending a vast volume of water racing toward Los Angeles and San Diego, according to a SlashGear report. The study, which was published in the Journal of Geophysical Research: Earth Surface, was led by geologist Mark Legg, who noted that earthquakes of a magnitude 7.0 have been reported in the past, so it’s not out of the realm of possibility that a more violent one could occur. Legg and his team were examining two active transpressional fault zones using high-resolution mapping, first taking a look at the Santa Cruz-Catalina Ridge and Ferrelo faults before taking new depth measurements over many hundreds of miles to get a better idea of crust activity. What they found was that there were multiple segments that could create a rupture that would be more than 100 kilometers long, and the tectonic plates could shift up during such a rupture, leading to a huge tsunami that would have a devastating impact on coastal California residents. The finding doesn’t mean people should panic, Legg said according to the report, only that they should realize that they are more vulnerable to tsunamis than they might realize and they should take steps to be prepared should one occur.